I reckon a plate of Schnitzel and potato salad is as German as it gets. 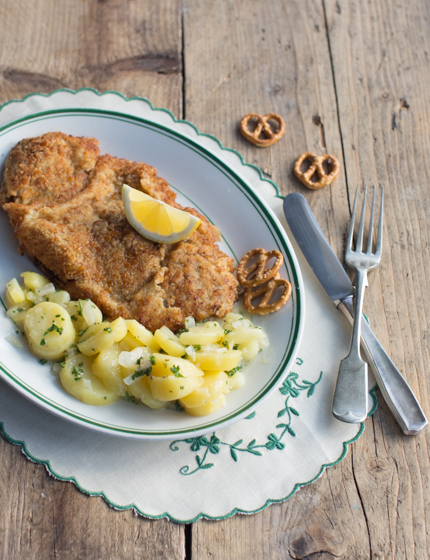 Fair enough, you could argue that the Schnitzel originally came from Austria, but even so – Schnitzel is a huge thing in Germany! And so is potato salad. I usually dress my potato salad with a mayonnaise-based dressing, which is typical for Luxembourg. In Berlin, however, I discovered another brilliant way to make potato salad: with vegetable stock. It’s far less greasy and the perfect sidekick to pan-fried Schnitzel. The pretzel crumbs for the Schnitzel are a fun little twist. You could of course just use ordinary breadcrumbs. Start by preparing the potato salad. Wash the potatoes and put into a saucepan with salted water. Cover, bring to the boil and cook for 20 minutes. In the meantime, peel and finely chop the onion. Heat one tablespoon of sunflower oil in a frying pan and fry the onion for 2 minutes, then put into a large bowl. Finely chop the gherkins and add to the bowl. In a small bowl, mix the mustard, white wine vinegar and a pinch of sugar and set aside. Drain the potatoes and rinse under a cold running tap. Leave to cool for 10 minutes; they need to be cool enough to handle but still warm. Peel the potatoes, cut into ½cm slices and add to the onions. soak for one hour, stirring the salad from time to time. After one hour, add the remaining three tablespoons of sunflower oil to the potatoes and sprinkle with fresh parsley. Season to taste with salt and pepper. Once the salad is ready, prepare the schnitzels. Put the salted pretzels in a ziplock bag, bash and roll over with a rolling pin until you have fine crumbs. Put on a plate. Crack the eggs into a deep plate and beat. Add the cream and beat again. Put the flour onto a separate plate. Lay out the veal escalopes and, if necessary, bash with a rolling pin to make them thinner. Season with salt and pepper on both sides. Dip each escalope into the flour, then into the egg/cream mix and finally into the pretzel breadcrumbs so it is evenly coated. Divide 160g butter between two large frying pans. 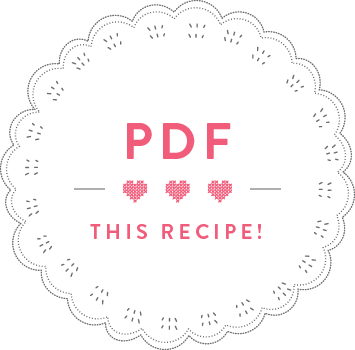 Fry two schnitzels in each pan – 3 minutes on each side – and give the frying pan a good shake once in a while, swirling the schnitzel around in the butter. Take out of the pan and drain on a plate lined with kitchen paper. 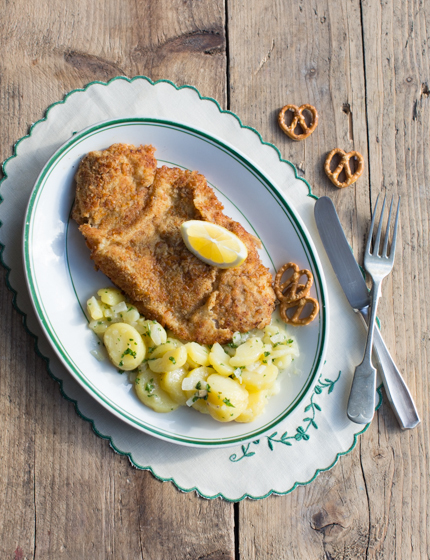 Serve each schnitzel with a lemon wedge and potato salad. TIP: You can prepare the potato salad up to a day ahead. Don’t forget to take it out of the fridge while you prepare the schnitzels, as it tastes best served at room temperature.